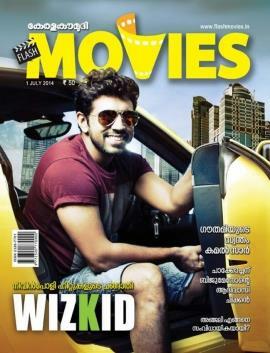 Flash Movies, the popular malayalam cinema magazine has published the July 2014 issue. The current issue which is thickly packed with exclusive photographs and interviews would entertain the readers. The highlights of this issue are specially arranged interviews with actors Nivin Pauly, Anjali Menon, Anoop Menon and Swetha Menon. Exclusive report on Kamalhasan and Gauthami, Comedy day special with Suraj, Shajon, Tini Tom, Biju Kuttan and Rachana Narayankutty will keep the interest high. After being credited with 3 back to back hits, young actor Nivin Pauly who is on cloud nine shares his way to the stardom with the readers. This issue is blessed with the photoshoot with Nivin Pauly. Another special attraction of the July edition will be the report on the relationship with Kamalhasan and Gouthami. Filmmaker Anjali Menon, the women behind the grand success of blockbuster movie 'Bangalore Days' shares her thoughts. Well set chat with comedy stars Suraj Venjaramoodu, Kalabhavan Shahjon, Tini Tom, Biju Kuttan and Rachana Narayanankutty will keep the readers intact. Actor Anoop Menon speaks about his filmy dreams and future projects. Swetha Menon on her third wedding anniversary finds time to talk about her film career and family life. Being a monthly magazine in Malayalam dedicated to the Movie and Entertainment world, Flash Movies from the house of Kerala Kaumudi comes along with its normal features and columns including photo shoots of celebrated artists, Reviews, Movie news and updates on the happening from the Kollywood film industry. A highly dedicated team of youngsters work behind the screen to deliver the best for the reading community in Kerala. Flash Movies is one of the most circulated monthly film magazine in malayalam which is widely popular among the celebrity circle too. As a regular reader, a well positive experience with this fantastic magazine can be considered before making a final judgment. With multicoloured papers, 'Flash Movies' tries to keep the standard of an international magazine. If you are an ardent fan of malayalam films and wish to get updated about the happening in the industry, Flash Movies will be the right choice.